After reading my post on how not to implement Agile, a friend asked me to write a post about discipline and discuss whether it helps or hinders creativity and innovation. Working in a creative industry, we often hear that innovation needs freedom from structure. Great ideas bubble up at random moments, ranging from the chatter of a heated debate to a quiet pause with a coffee and a magazine. As a result, discipline is perceived as a something that will inhibit creativity. However, as leaders we know that a certain measure of discipline is needed to make these ideas into reality. So, how do we reconcile these opposing views? Let’s first understand what we mean by discipline. At work and in the innovation process, we are often referring to self-discipline, which involves willpower and persistence and keeping yourself motivated, despite the hurdles encountered along the way. It is this sort of discipline that gets world-class athletes to train at 5am and actors to learn their lines and rehearse them over and over and over again. Like with these examples, discipline also refers to an activity that improves a skill, which we could also expand to improving or developing a product or process. What this all boils down to is that discipline means a lot of hard work. In a constructive professional environment, discipline does not mean punishment or blindly following rules just to make your boss happy. That sort of discipline works against innovation, no debate there. 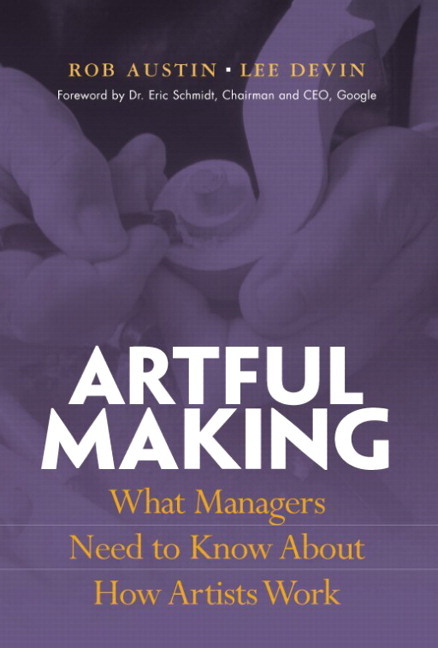 In their book, Artful Making: What Managers Need to Know About How Artists Work , Robert Austin and Lee Devin describe the process used in theatre as being both creative and structured. The structure ultimately comes from the date set for opening night. Theatres are booked many months in advance and regarded as immoveable. Cancelling or postponing a show has serious consequence to the production’s finances and reputation. The need to be ready by a certain date drives the process to prepare – rehearsing regularly, building the set, sewing the costumes, etc. The creative freedom takes place within that structure with the countless numbers of choices and decision everyone is making throughout the process. The actors, for example, are encouraged to make choices with their role, their line delivery, their movements and how they respond to each other’s roles and lines and to see where their decisions take them. The process is constructive in that they each build on each other’s choices with the potential of making something new. It’s this combination of talent and discipline that defines a play’s success.Every summer I am reminded of that theatres have similar innovation challenges as other industries. Shakespeare-in-the-Park is popular summer theatre in many cities. The Bard’s plays have been around for centuries and everyone is familiar with his most famous stories. I have seen the same plays multiple times and each time was a different, unique experience, thanks to the creative choices made along the way. Implementing Agile, or any other process, needs the same balance of talent and discipline to succeed and to encourage innovation. The self-discipline needs to be applied to focussing on the customer, maintaining and prioritizing a backlog, maintaining regular, visible two-way conversation practices, setting and meeting commitments as a team, and continuously improving. The creative expression of talent happens when the teams are given the freedom to determine how to solve the business problems presented to them. This includes how to adapt the areas needing discipline to work best for them. There is both structure and freedom within that structure. Achieving the balance between talent and discipline is hard work and needs its own commitment and discipline to help it thrive. Once you have achieved that, though, it’s magic!